Two years ago today, I left the United States with 130 pounds of stuff packed into 3 bags and a one-way ticket to the next chapter of my life. Sixteen months earlier, I had met a guy in a Paris bar who would end up changing my life forever. I had just left my job as a lawyer in DC, thinking my life was going to go in a certain direction … but then, during a week-long vacation in Paris, I crossed paths with Michel. It was a romantic story worthy of a Hollywood screenplay, and it very quickly set in motion a complete reassessment of my future plans. By the time I left Washington for good on August 15, 2010, I had fallen in love, I had gotten engaged, I had applied to a French language program in Paris, I had gotten a one-year student visa from the French Embassy, I had gotten married, and I had said goodbye to my closest friends in Washington, not sure when or if I’d ever come back there to live. During the last two years, I’ve lived a life completely different than the one I led before. Instead of living in a 1,100-square-foot apartment in Adams Morgan with the most adorable French bulldog on the planet, I now live in a 205-square-foot studio in La Courneuve with two very furry cats. Instead of working for a prestigious law firm doing securities regulatory work, I now write a blog, I search for that elusive English-teaching position, and I go to school to improve my French. My daily life has changed dramatically … I don’t hear English anymore, except when I’m watching American television shows subtitled in French, Skyping with my mom a few times a week, or passing tourists on the streets of Paris. I can’t go to my amazing church anymore, which used to be a central part of my life. I can’t go out for a drink with my best friends anymore, either, just to shoot the breeze about anything and everything. I can’t even eat my favorite foods now, because you can’t get Meiwah‘s steamed veggie dumplings or Busboys and Poets‘s tempeh panini with sweet potato fries here. But life in Paris has filled these voids with other things … wonderful things. I have new friends, not only French ones but, thanks to my French courses, expatriates from countries around world. I have a new extended family, too: parents-in-law who love me and support me like their own … brothers- and sisters-in-law who embrace me … a nephew and three nieces who love their Tonton Michael, despite his strange accent and occasional inability to understand a word they’re saying! And I have a husband — the very reason I came here — who, with a single glance on a chilly April evening forty months ago, set this whole change in motion. In the beginning, he was like some ephemeral dream—something distant and exotic—but today, he’s my rock, and I couldn’t be here without him. 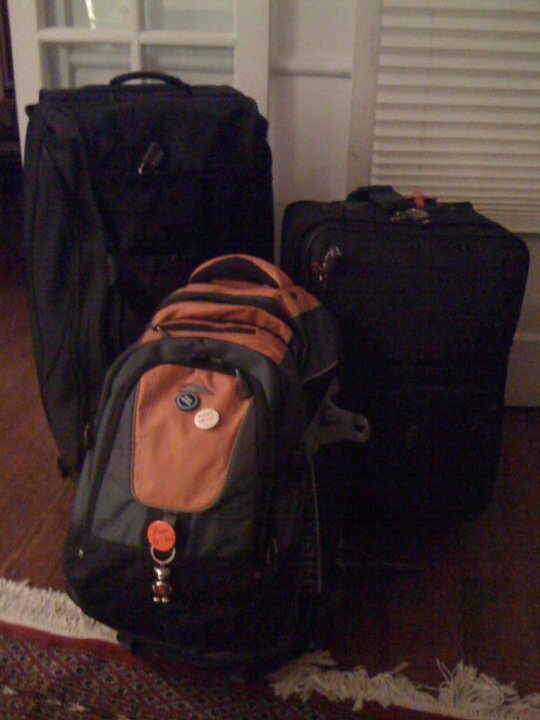 Yes, two years ago, I left the United States with 130 pounds of stuff packed into 3 bags and a one-way ticket to the next chapter of my life. When melancholy and nostalgia for a life left behind start to creep in, I have to remind myself that life is change. Today’s fears, anxieties, regrets, and dreams are not the ones I had two years ago … and in two more years’ time, I’ll have others yet. Life is always onward—never backward—and that’s good, because that’s what our lives … our stories … are made of. is always open halfway through. ← It’s Not You … It’s Me.